Camping in Glacier National Park was one of the best experiences we’ve had as a family. If you’ve been keeping up with our adventures, you’ll already know that the last stop on our 2017 summer road trip was Glacier National Park. 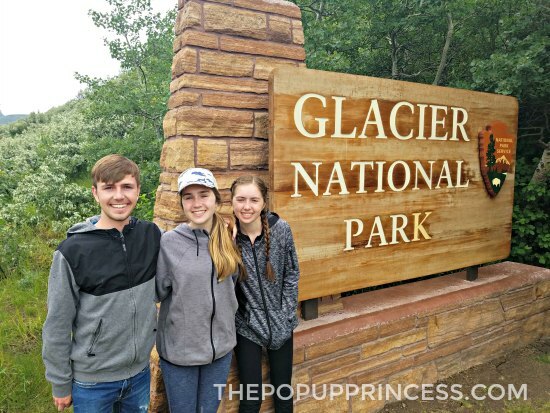 If you’re new here, be sure to check out our post on Glacier and all the amazing adventures we packed into three days. It was amazing! 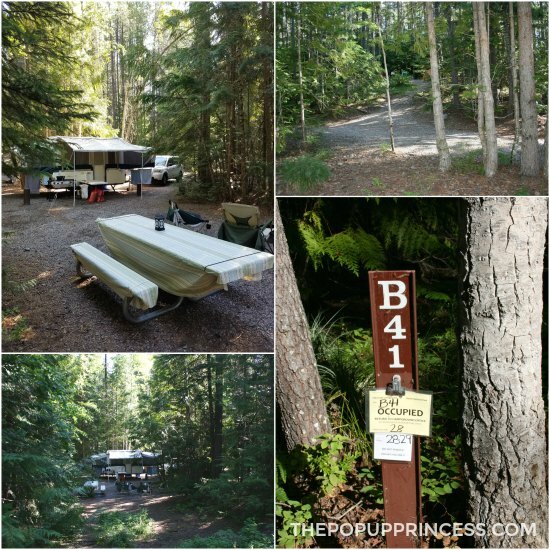 We spent the first two nights at Fish Creek Campground. Because we were visiting Glacier in summer, I knew it would be crowded. Most of the campgrounds in the park are first come, first served with the exception of Fish Creek Campground and St. Mary Campground. Reservations for those can be made in advance online. Because we were on a lengthy road trip, we knew we needed reservations, so it came down to one of those two campgrounds for us. St. Mary is the largest campground, but it is on the east side of the park. Fish Creek comes in second in size and has many of the amenities that St. Mary has, but it is on the west side of the park and close to Lake McDonald. That made it a winner for us. We booked our reservations in early March and secured one of the last sites available–site B41–in June. This was not the most ideal site as it was next to the bathrooms and there were only two nights available, but honestly, we were really excited to have even secured a site at all. 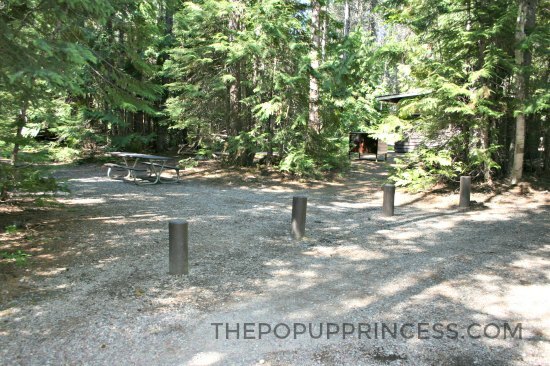 There are 178 campsites in Fish Creek Campground, however many of them are quite small. Only 18 of those sites will accommodate anything longer than 35 feet, and that includes truck and trailer combinations. Most of the sites are surrounded by large trees and provide quite a bit of privacy from the surrounding campsites. This was especially nice for us, since we had campsites all around our site, and a trail to the bathrooms ran right along the back of our camp. There are four loops in Fish Creek Campground: A, B, C, and D. Our site was located in the B loop. The sites that offer views of Lake McDonald are located in the C and D loops. We drove those loops during our stay, and they were truly beautiful. These loops are a little tight, though, and RVs and vehicle/trailer combos longer than 28 feet will have trouble navigating the roads–especially in loop D.
Maybe it was because we were visiting early in the summer, but the privacy of the Fish Creek campsites was hard to beat. The campground was full, but it was still very peaceful. 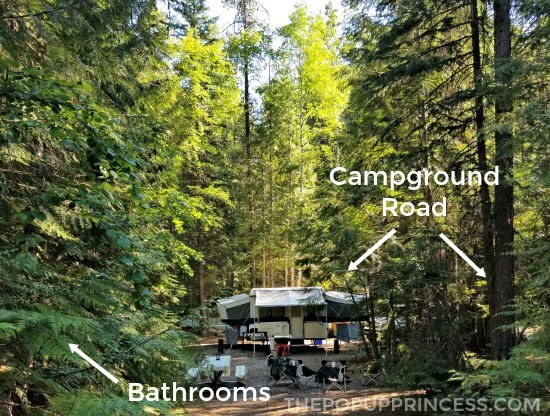 We did have a few kids who insisted on walking through our campsite to get to the bathroom, but if we hadn’t been in the path to the bathroom, it would have felt like we were completely isolated. Don’t get me wrong. Fish Creek is very family-friendly. There were definitely kids riding bikes and running through the campground roads, but the forest really absorbed the sound. Our site felt serene and peaceful, and when the evening rain pattered down on the camper roof, we were lulled to sleep both nights. It was a pretty perfect way to end a busy day. Fish Creek Campground has 178 campsites, which are reservable in advance for $23/night. 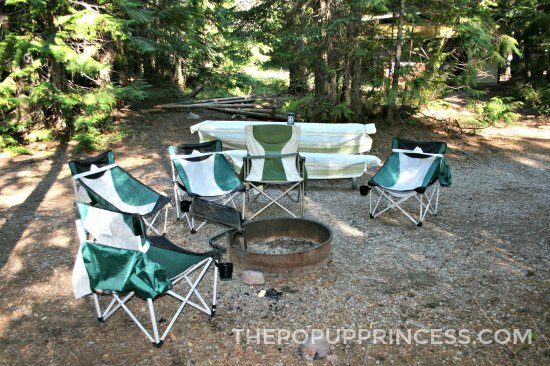 Each site offers a fire pit with attached grill and a picnic table. There are no hookups, but water is available throughout the campground. 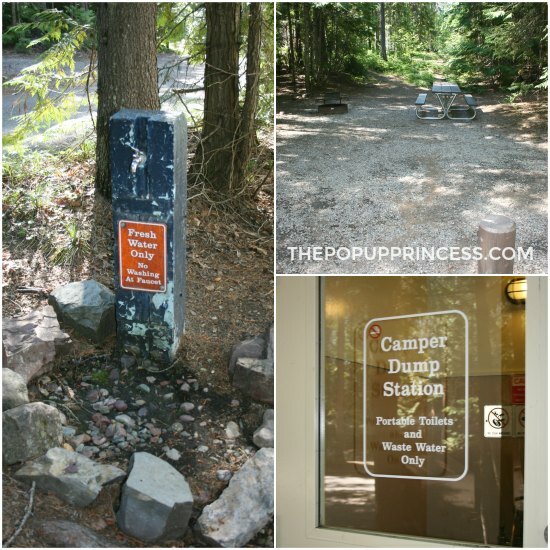 There is also a dump station in the campground, and in each loop there are individual campers’ dump stations for gray water and portable toilet waste. Sites within Glacier National Park fill up fast, so make your reservations early. There are showers in the A loop, but there are only four. These showers are available to campers in the Fish Creek and Apgar campgrounds, so they get very busy. When we visited, they had been used by hundreds of campers since their last cleaning, so they were filthy, too. If showers are important to you, you may want to plan to visit them during the late morning or early afternoon hours when they are less busy. Loops C & D offer a few sites with lake views. They fill up FAST and cannot accommodate larger RVs and vehicle/trailer combos. If your rig is over 28 feet, consider staying in the A or B loop. Those loops can accommodate RVs up to 35 feet in length, and you’ll have an easier time maneuvering. 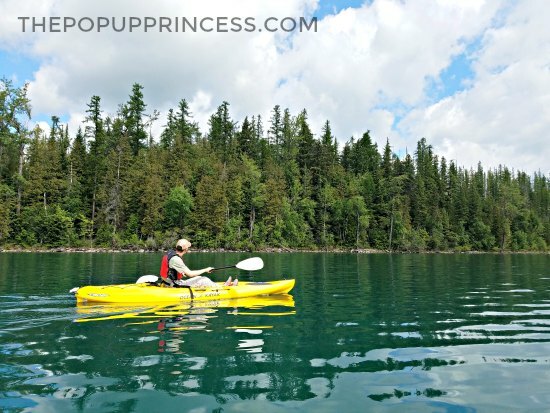 Fish Creek is close to Apgar Village and Lake McDonald, and there is plenty to do in the area. Make sure to check out our post on Glacier National Park for a rundown of all the activities in the area. We rented kayaks, went horseback riding, did some souvenir shopping, grabbed ice cream, went hiking… There is SO much to do in Glacier! Check-in was a breeze. The staff was wonderful and helped us get to our site and find everything we needed. I really cannot stress that enough. Everyone was super friendly and helpful the entire stay. The downside? 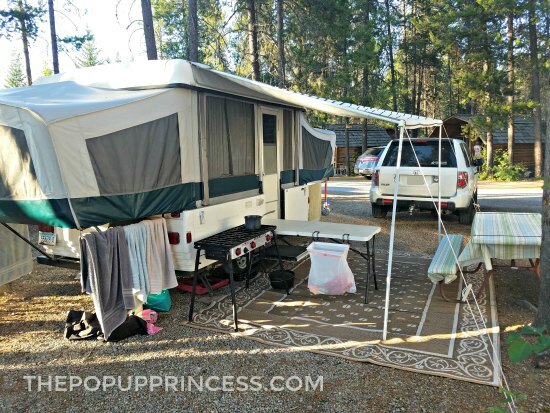 These campsites didn’t have the privacy we enjoyed at Fish Creek Campground. The only sites left when we booked our stay were pretty close together. Let’s just say we got to know our neighbors really well. This can either be a good thing or a bad thing, depending on the neighbors. 😉 We were lucky. We had some great neighbors and really enjoyed chatting with them during our stay. But I will say that we were awakened very early both mornings by a crying baby in one of the campsites nearby, and in those moments, we wished for a little more seclusion. The amenities in West Glacier KOA are hard to beat, though. Our site had water and electric, but no sewer. We had to use the campground dump station for gray water. There was a picnic table and grill in our site, which was nice, however, we didn’t have much room to spread out. We kept our chairs packed away and used the picnic table for seating. I will say the site was pretty tight, so we didn’t spend much time out around the campfire at night like we did in Fish Creek. 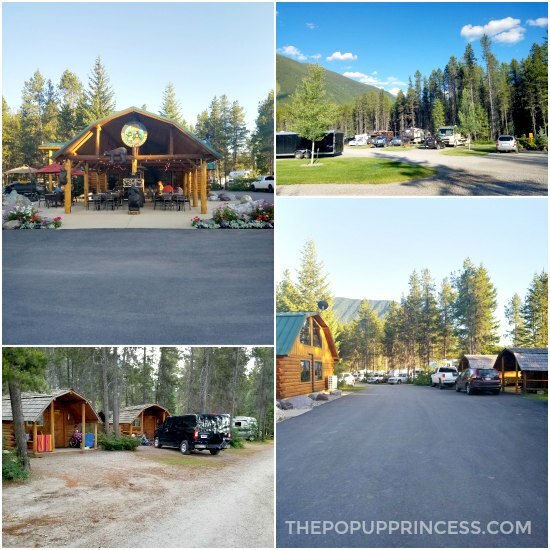 Pricing at West Glacier KOA varies depending on the site and season. During June when we stayed, our site ran around $70/night. 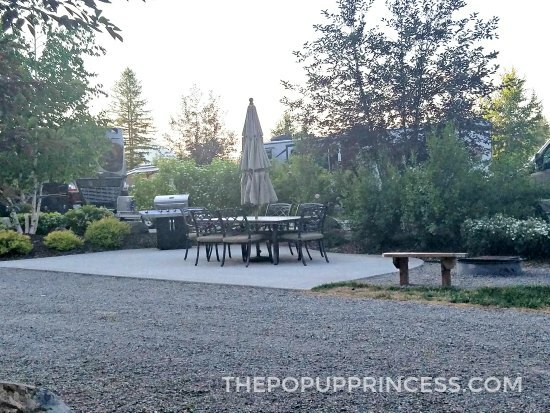 For about $130/night, we could have stayed in a deluxe pull-thru patio site, which had full hookups, mature trees for privacy, a full patio table with chairs, and a gas grill. It also had a fire ring and much more room to spread out around it. We had to pass by these sites on the way to the laundry facilities, and I would gaze longingly at them as we walked by. I’m not sure our budget could have afforded a site like this, but they sure were nice. Another amenity we were grateful for at West Glacier KOA was the WIFI. We didn’t even have wireless service inside Glacier National Park, let alone WIFI. Normally, we’d be all over this, but in order to take long road trips like this, Mr. TypeTwoFun has to work on the road every few days. Sometimes, the WIFI at a campground is worthless, and we end up packing up in search of a Starbucks. The WIFI at West Glacier KOA was awesome. It was fast and didn’t get bogged down by too many users. We were able to work when we needed, and that always makes our trips flow smoothly. 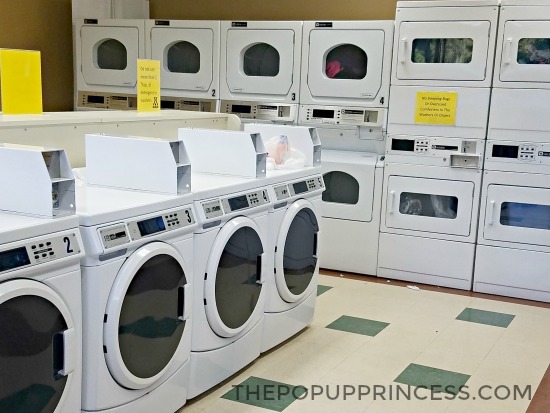 Another thing that makes our trips run smoothly is great laundry facilities. We pack five family members into a small car (and even smaller camper) for three weeks. That means we pack light, so we love campgrounds that have efficient laundry facilities, and West Glacier KOA definitely delivered there. When the rest of the family went horseback riding (you can read about that here), I popped into the laundry building to make sure we had clean clothes for the rest of our trip. There were plenty of machines available, and I was able to get all my laundry finished before the kids made it back to camp. That was a win for this mama. 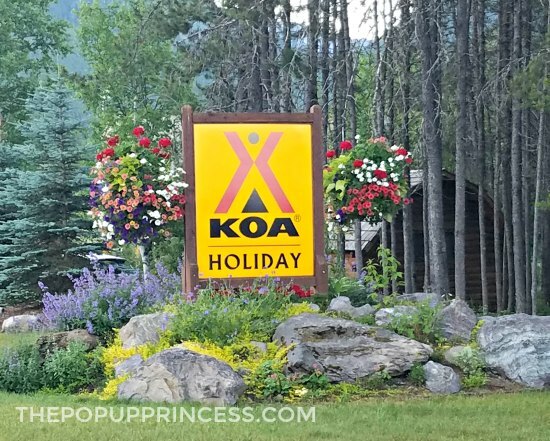 West Glacier KOA boasts “Holiday” designation, which means it is more of a destination campground than a short stop-over. There is a large swimming pool, playground, restaurant, coffee shop, and a cute ice cream shop, which we hit both nights after dinner. Yum! 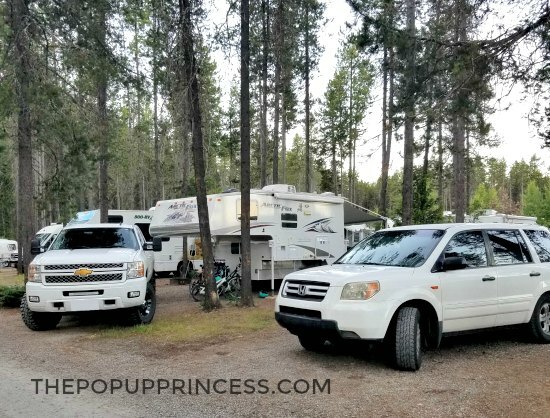 It is really a very family friendly campground, and there were lots of kids riding bikes and scooters, playing tag on the playground, or enjoying a swim in the evenings. Despite the chilly weather while we were there, the carefree feeling of summer permeated the place, and you could hear the sounds of Marco Polo games and hide-and-seek countdowns into the night. We really enjoyed our time there. 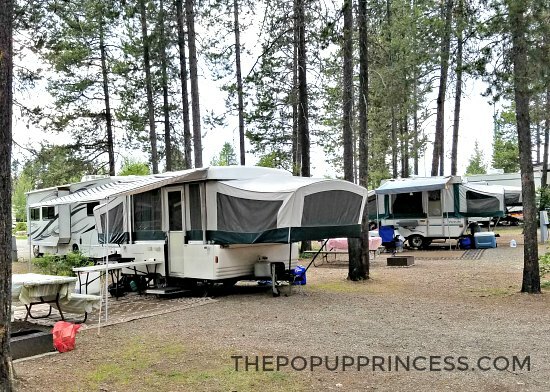 West Glacier KOA has a variety of sites at different price points throughout their campground. 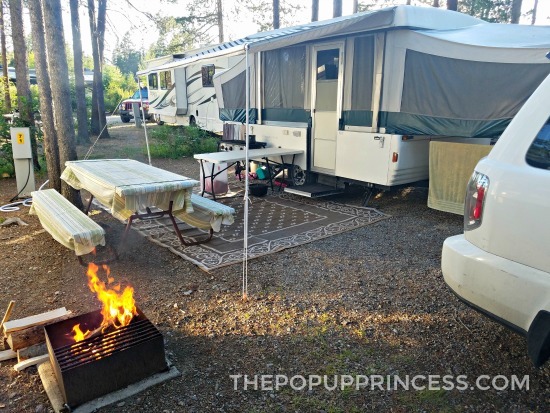 While they are all much more expensive than a site in the neighboring national park campgrounds, they are often easier to come by and have all the amenities you won’t find camping inside the park. If you need those amenities, you won’t find a better campground that West Glacier KOA. Even though sites are easier to come by at West Glacier KOA, they still sell out fast. We made our reservations in March and snagged one of the last sites available on June 30. If you know West Glacier is on the itinerary, make your reservations as soon as possible for the best availability. If you value your privacy over cost, splurge for one of the deluxe patio sites. Not only will you get a patio, full table and chairs, gas grill, and fire pit, you’ll also get a larger site with mature trees that separate you from your neighbors. The smaller back-in sites are cheaper, but you will also be very close to the neighboring sites on all sides. West Glacier KOA has been given the Holiday designation, so there is a lot to do in the campground. It is all very family friendly, too. There is a pool, playground, various game courts, an ice cream parlor, and a restaurant on site. They even host magic shows and birds of prey demonstrations that are great for the kids. 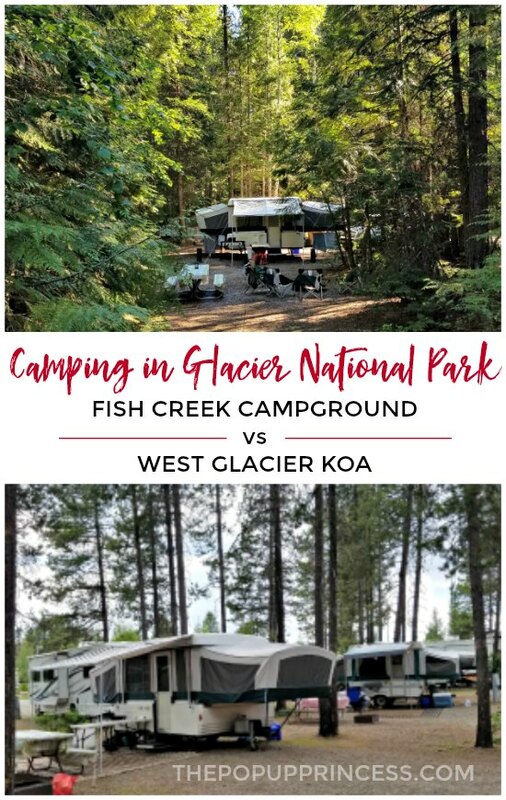 Fish Creek Campground vs. West Glacier KOA? So which did we like best? Honestly, we loved them both for different reasons. 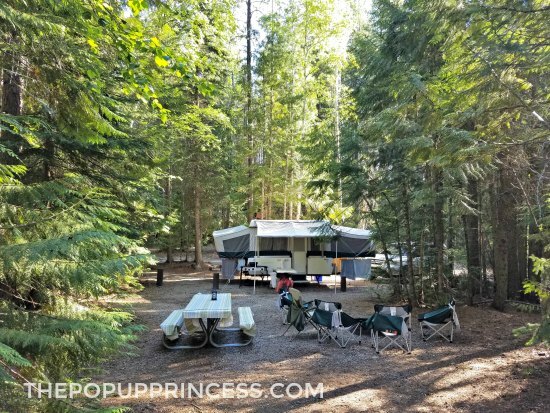 We loved the privacy and convenience of Fish Creek Campground. It was much more peaceful than West Glacier KOA, and you can’t beat the price. After two nights in Fish Creek, though, we were ready for a shower and laundry, and West Glacier KOA was perfect for that. Staying in both places really was the best of both worlds for us, but we realize that isn’t realistic for most campers. We also stayed at Fish Creek while visiting Glacier. We were in site C-118 and it is a fantastic site for a popup. It’s just off the lake but is a walk from the bathroom. My only complaint about Fish Creek is the mosquitos. They. Were. Insane. For sure, Caroline. We used a Thermocell Lantern on this trip, and it totally saved us. Thanks for the suggestion. We’re headed to Northern California this summer so I’ll make sure to get one before our trip. 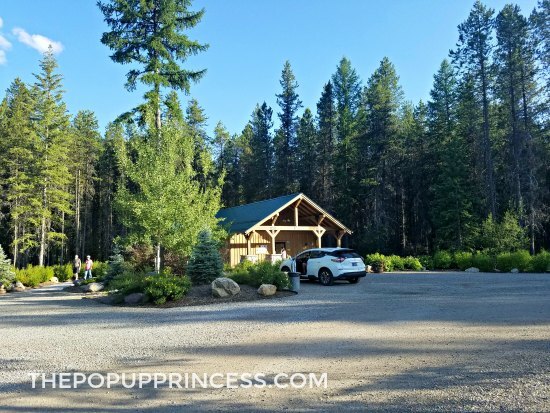 We stayed at the Glacier KOA last July in the site just behind where you did in our PUP. It was pricey but perfect for our 3 kids. We met our close friends from CO there. We wanted to stay in the park because it’s cheaper, quieter and bigger sites but trying to make reservations, even 6 months in advance for two sites, was next to impossible. Book SUPER early for campgrounds in the park. The KOA amenities made it a glamping experience. via you and your legions of followers 🙂 Glacier was on the must-do trip planning for this summer however other matters have become a priority, but I’m thinking this Fall might be possible, more homework to do and you have given me some things to consider. Cheers and continued adventures! As a Montanan I’ve actually stayed at all of these campgrounds. I agree that the WG KOA is amazing and we had a great time there for a family reunion. I would actually choose the Many Glacier Campground over the Fish Creek Campgound. There are some amazing sights and sites and I always see more bears on the east side of the park than the west side! But there is really no bad place that you won’t see the Wonder of God at GNP! 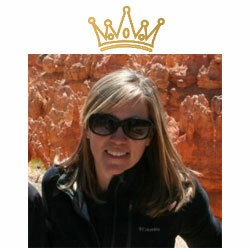 Great blog and interesting comparisons between the two sites. To reduce disruption from noisy neighbors last year, we downloaded a white noise app onto our phone and played it through a Bluetooth speaker. We all sleep great and wake up when we want not when other campers do! Great post and reviews, thanks! We are heading that way in late August with our popup, but do not have reservations. Been loking at the campsites in GNP and fill dates/times. Looks like a few sites are listed as being able to accomodate RV’s up to designated lengths, do you recall if other sites will handle a pop up or are they mainly tent sites? We really only visited Fish Creek and Apgar campgrounds, Ron. There were quite a few RV sites in both, though. If you need bigger sites, we’d suggest the KOA, though.